The last 2 days have been busy, and full. On Wednesday, Rob helped my niece, Rachel, move home to her parents’ house. She is leaving on a big adventure to Ireland in January and does not want to keep her apartment for the 6 months she will be gone. He kept our girls occupied with that project and some errands, and I kept Jake occupied. We hung around his house all day. Since Jake’s big sister came home from college late, late at night Tuesday, all of the big girls were exhausted, since they had gone to get her from the airport. Jake did not go. So, he kept me busy. 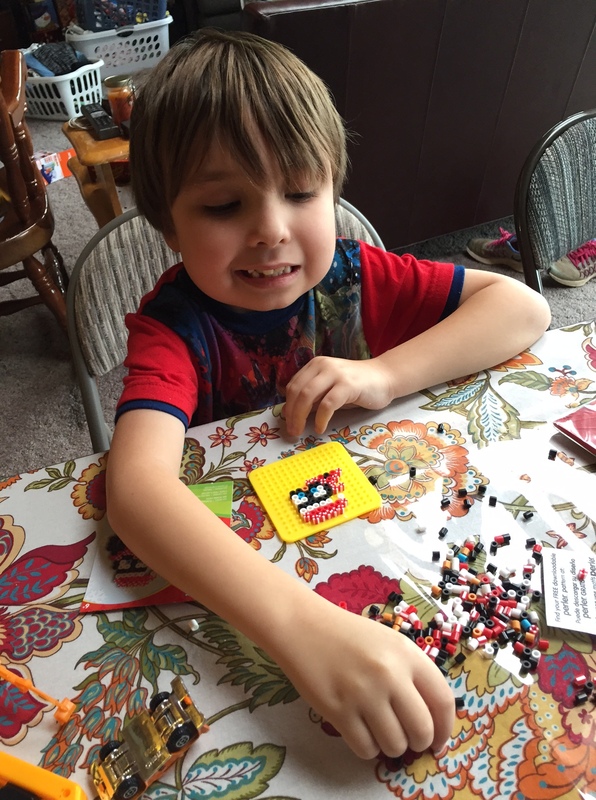 I’ve been having him try the Perler bead projects. I was so proud of him. This penguin is the first one that no one had to finish for him. He got it all! 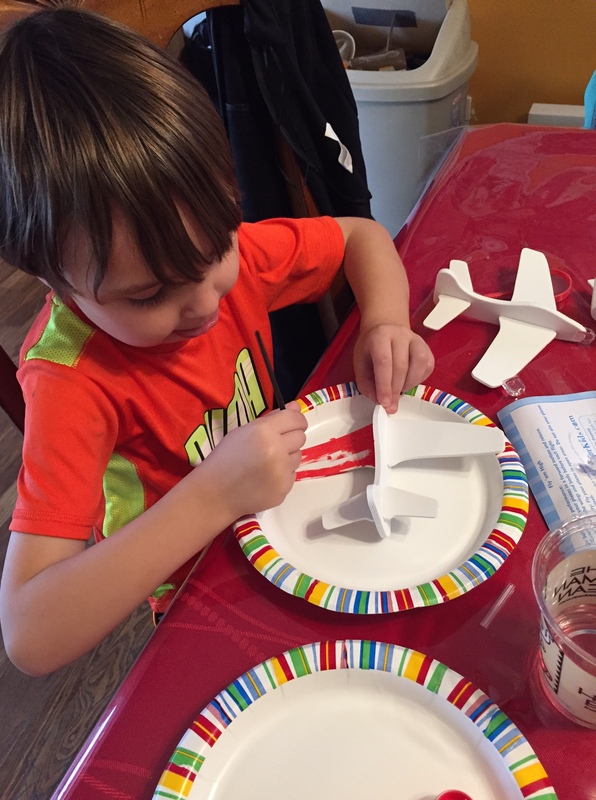 Today, we did chores, etc., and some more crafts. I had no idea he liked crafts so well. This is definitely the time to buy kid crafts. I have been able to pick up several kits for 50% off, or even 60% off. I shopped at JoAnn’s and Michael’s. I got a lot of bang for my buck. He wanted me to sit beside him most of the time, all day, both days, but it was mostly for company. 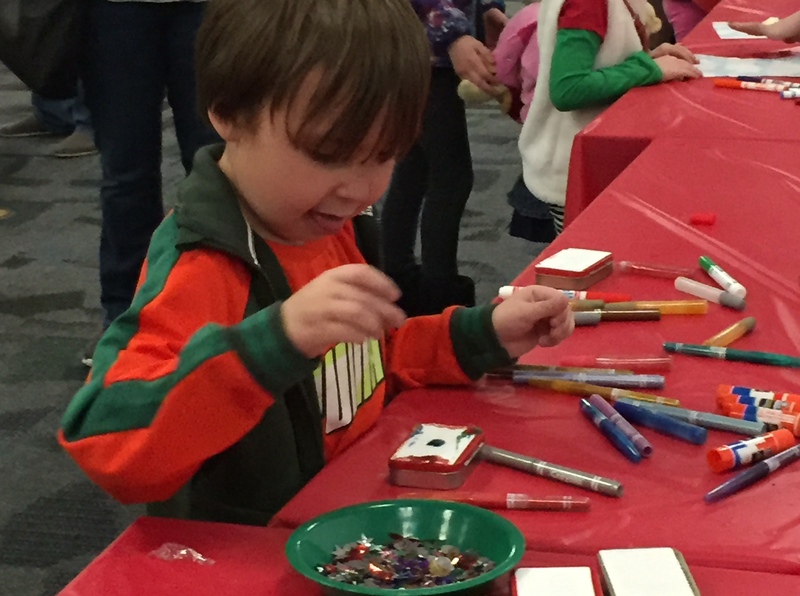 He loved doing the crafts. So, this afternoon, Rob came, with the van, and we went to the library where they were having an activity where kids could go from table to table making Christmas gifts. He made crafts until he had visited each station, and even made some things twice. Who knew? 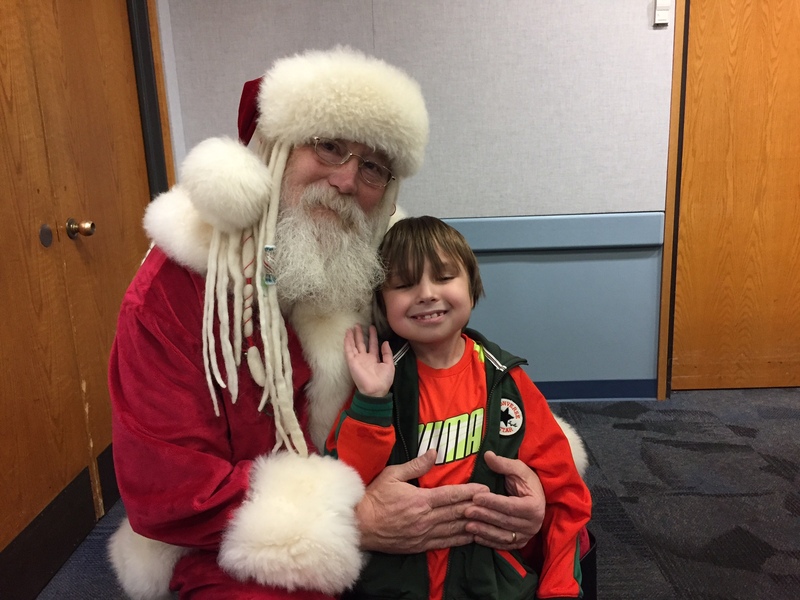 He also enjoyed visiting with Santa, who stopped by. We even got an Amelia Bedelia book, as he has begun to enjoy that character. While he and Patsy made crafts, the big girls (all 4), wandered through the huge library, enjoying themselves. It was good to spend time with Caitlyn as she isn’t home very often. 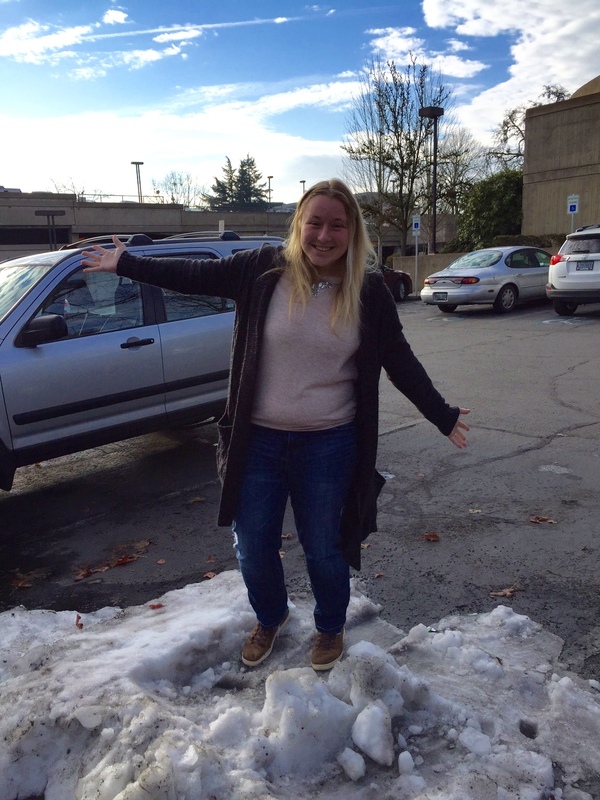 We couldn’t resist a photo shoot in the remaining pile of snow in the library parking lot. It’s the closest she got to the fun of the big snow, since she goes to school in southern California. The only piles left are where people plowed or shoveled it into heaps during the storm. It worked for her! Once we did an errand for Alissa, bought a few more crafts for tomorrow, the library, and picked up some photos Rob had ordered from Fred Myers, several hours had passed. The afternoon was awesome, and I have to admit that french fries were involved. Tomorrow, I will spend another day with the kids, again focusing on Jake, and then I have next week off from such structured activities. We will still see one another, but their mom and day and big sister are going to keep Jake happy and busy since they all have the week off,and I’ve got a few things planned for Rob and my girls to do a few of the days, plus at least 2 family dinners. Fun all around! I loved Amelia Bedelia! Sounds like so much fun! He had never heard of her, but I read one to him this morning and then he asked for another book about the lady who gets so mixed up. Got to love it! Becky, I have a book for you to share with Jake that I found by accident at the library when my daughter was little. Here is a link to a YouTube of the first book being read (great for when you are trying to entertain while getting other things done): https://www.youtube.com/watch?v=BfjNsk3MR0g There are other books about Walter and his family adventures, all of them are very funny! You can look for more at your library the next time you go, if he likes this one. You have been busy! How old is Jake? I’m sure you guys have a ball!! Some day maybe you can list your siblings and which children belong to who. Lol. Hope all of you have an awesome Christmas….Vicky in Ky.
Jake is 8. He will be 9 in January. He has some developmental delays, as well as a much shorter stature than other 8 year olds. We do have a blast! The more I spend time with him, the more fun we have, as I get to know his likes and dislikes. I just have 2 sisters–Rosalie and Gail. Rosalie has 2 children, Rachel and Steven, and they are young adults. Gail has 4-Caitlyn (college age), Michaela, Alissa and Jake. I have 8 children–ranging from 36 down to 12. You mostly read about the 3 youngest, Lovana (20), Ja’Ana (16) and Patsy (12), with an occasional reference to one of the older ones. Thanks for the clarification. I love to read about all your family adventures together. It’s wonderful that you are all so close!! We have such a small family, but a blessing nonetheless. Merry Christmas!…Vicky in Ky. Thank you. A friend and I were just discussing how frustrating it is to read blogs where they talk about “Sam” or “Fred” or “Suzie” and we’ve never even heard of that person before. Or, things like “after I got that thing fixed after the situation last week….” (when looking back on the blog says nothing about what happened last week or what the “thing” is). I try not to do that, but it is very hard to stay clear with who is who without overexplaining. Thanks for asking, and I’ll try to keep it clear:) We are a close bunch and it’s easy to get mixed up on who is who.